In addition to submitting videos in the correct format, you also need to make sure your audio meets the technical standards for Grady Newsource, which is based on the standards for broadcast audio, with slight modifications. Note: The standards for web videos, DVDs, and other distribution platforms will likely vary. It’s up to you to find out the specifications. Most content distributors will send you specific audio standards that you can follow when submitting work to them. Audio Levels – your VO tracks and SOTs should have an average peak around -18 dB. Don’t have any peaks above -12 dB. The image on the left shows an audio track with waveform display. The audio meter to the right has the dBFS (decibels full scale) values. This audio track is peaking within our target range. Audio Panning – your VO tracks and SOTs should be panned to the “middle,” meaning I should hear the audio in both the Left and Right channels. When listening with headphones, you should hear these audio tracks in both ears. Natural Sound – there’s a lot more variability with nat sound because so much depends on the type of sound and where it’s used in a PKG. That said: as a general rule, your nat sound should not overwhelm your VOs or SOTs. At key points in the PKG, you can use nat sound as the primary sound. We often call that a “pop” of nat sound. An example would be a story about home construction. I could use short bursts of nat sound (:01 – :03 seconds) in between VO segments or SOTs — the nat sound would be the only thing we hear at that point in the PKG. If you do this, you can let the nat sound peak between -12 dB and -18 dB just for those few seconds. As soon you hit the VO or SOTs, you need to bring the level of your nat sound back down so it’s “underneath” your VO or SOT. Here’s an example of a Timeline in Adobe Premiere Pro. Notice that there are two VO tracks and two Nat sound tracks. 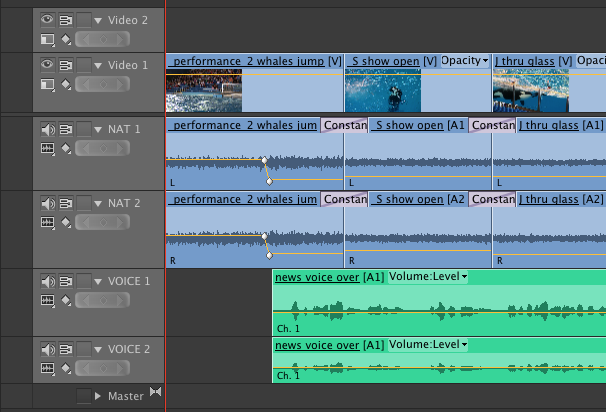 The PKG starts with the nat sound peaking at -15 dB, then I used keyframes to drop the volume just before the VO begins. For the rest of this segment, the VO has an average peak of -18 dB, while the nat sound remains present but never overpowers the VO. No audio peaks above -12 dB.